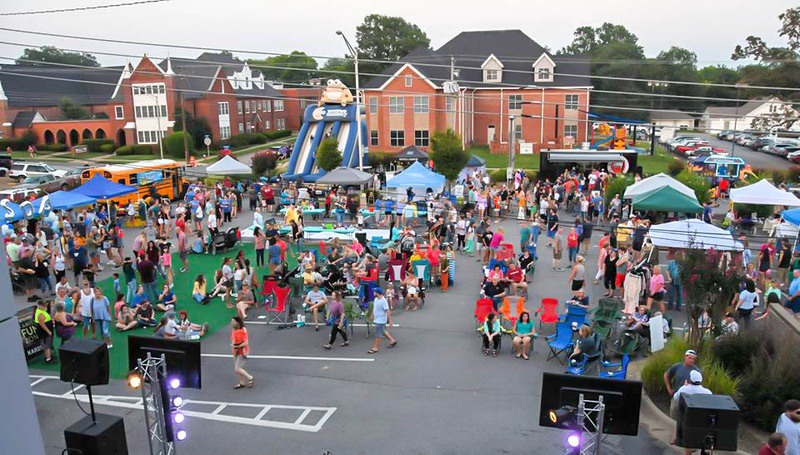 Amanda Brinkman and Ty Pennington, hosts of “Small Business Revolution – Main Street,” will attend the first Beats and Eats festival of the year tonight to announce Searcy’s six small businesses chosen for a makeover and the opportunity to be featured on season four of the Hulu show. Originally, Beats and Eats was meant to be held in May, according to Mat Faulkner, owner of Think Idea Studio and community organizer, but the hosts wanted a large crowd for the announcement of the winners. Faulkner said he believes the efforts of Beats and Eats over the past two years has paved the way for the Searcy community to have a strong experience with the TV show. Marka Bennett, co-coordinator of Beats and Eats, said Searcy is finally at a point where they are ready for a transformation. “Beats and Eats really begins the connection to the revolution,” Bennet said. Bennett said she and the rest of the Beats and Eats coordinators are expecting a bigger crowd this year to welcome Brinkman and Pennington as they commence the start of the series. Despite only six businesses being chosen to receive a makeover, Faulkner said other businesses will take part in the revolution as well with a renovation of the exteriors of their storefronts so that all of Searcy can feel the impact of the movement. Deluxe, the company that sponsors the show, hired Flow Nonfiction from Texas to film the event, according to Faulkner. Heather Kemper, co-coordinator of Beats and Eats and events and projects director for alumni and parent relations, said the event will be held on Spring Street so the filming crew can get shots of Searcy staples like the White County Courthouse, Rialto and Think Art Alley. Entertainment will include local musicians, food trucks and merchant vendors. Unlike previous years, non-profit organizations have been given a free booth so that they too can contribute to the community’s revolution, according to Kemper. “We’re encouraging people to come down to find out how they can get plugged into the community to have a personal part in the revolution,” Kemper said. On March 27, Harding will host a free small business seminar sponsored by Deluxe to offer information about branding, marketing, accounting and business planting. Faulkner said the seminar is not limited to small businesses. To sign up for the seminar, visit www.dexlue.com/sbrc. Beats and Eats will begin tonight at 5:30 p.m. and the announcement of the top-six businesses will be at 7 p.m.